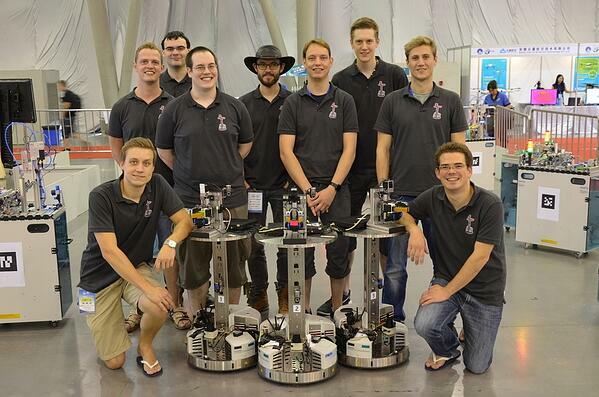 NETRONIC staff member Nicolas and his team won this year´s RoboCup Logistics League competition in Hefei, China. RoboCup is an international competition which is all about artificial intelligence and mobile roboters. Each year, scientists and students meet the challenge of competing for the best roboter. The roboters of the Carologistics team from Aachen won against all other competitors at the world championship in Hefei, China, in July of this year. Nicolas, working student with NETRONIC, also belongs to the team. By winning the world championship this year, the Aachen team could repeat their success. 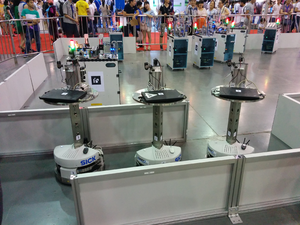 Last year they returned from the RoboCup Logistics League 2014 in Brazil as world champions thus proving their ability to build and control roboters (hence, the German football team was not alone winning the world championship in Brazil last year). This year in Heifei, Carologistics again proved that their roboters can master logistic challenges.They clearly won the finals against the Swiss team Solidus with 46:16. In the exploration phase, the Aachen roboters recognized more of their work stations than those of their competitors. In the production phase they could collect points even without competition because the Swiss team had only focussed on recognizing the stations and had not handled the product-specific tasks such as fetching and further transporting certain workpieces and raw materials. 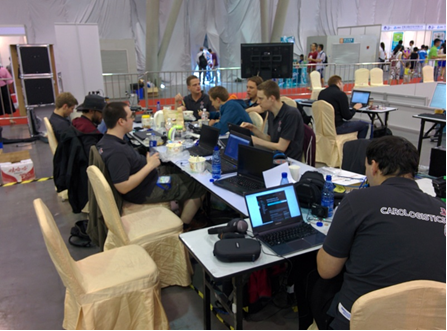 Each year, RoboCup Logistics League holds new tasks to put the competitors to the test. Last year, the workstations were fixed to certain positions on the playing field but this year there was no information given as to position or orientation before the competition so that the workstations had to be placed in zones without exact positioning. Moreover, the number of product versions to which the roboters had to react was increased from 3 to nearly 300. Even during the competition the Carologistics team worked vigourously at improving the program and the roboters. We congratulate the Carologistics team, consisting of RWTH and FH Aachen students on their world championship and we are glad for Nicolas about his success. The finals can be watched on YouTube . The Carologistics team has put together more details in a blog. 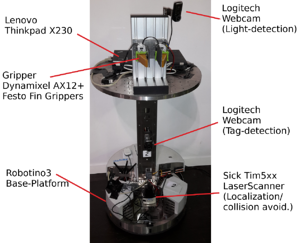 More information on RoboCup 2015 and its various leagues (Logistics League, Robo Soccer League, RoboCup @Home etc.) can be found on the RoboCup pages.